In 1948, George Orwell wrote “1984.” It was a depiction of a frightening year, not unlike what was happening behind Russia's iron curtain in 1948, and predicted that the same thing would be happening by 1984, all over the world. 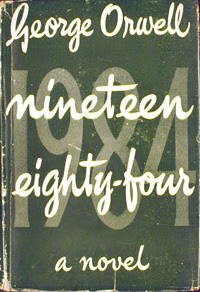 As the 1984 date grew closer, many people were getting anxious as to whether Orwell’s novel was truly precognitive. Fortunately the date came and went without the sky falling in and few people remembered anything at all unusual about the year 1984. That is, if they remember the date at all. But everyone who was around in 1968 remembers that year quite well. “The coming year (2008) will be chock full of 1968 commemorations. Now add to that, 1960 to 1968, which included: The assassination of President John F. Kennedy (1963), massive student demonstrations beginning in 1964 against the Vietnam War, the Civil Rights movement and riots (The Civil Rights Act was passed in 1964), the Watt’s Riots (1965), the riots on the Sunset Strip (1965), and, don't leave out, The Lloyd Thaxton Show (1961-1967). Forget 1984, 1968 was, as Todd Gitlin put it, “the pivotal year in which the convulsions of a decade converged and the country slouched over the edge of a precipice.” Whoa Nellie! There is no way one could forget where they were and what they were doing in 1968. I was hosting the TV show Showcase ’68. It was a summer replacement for The Jerry Lewis Show on NBC. The show came pretty close to causing a 1968 event all by itself; “The Showcase ’68 Berkley Riots.” Showcase ‘68 was a traveling talent show, somewhat like American Idol. During the summer it visited ten cities searching for and presenting new young professional talent. There were also special guest stars like Neil Diamond, Tammy Wynett, Bobby Vinton, Bobby Goldsboro, and Della Reese, who appeared throughout the 10-show series. 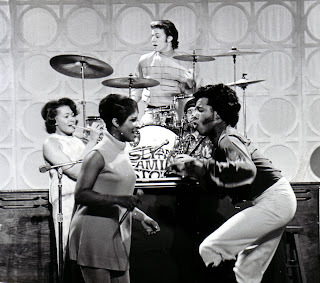 The contestants included, among many others, Sly & The Family Stone and The Chambers Brothers. The first show we did was at The University of California at Berkeley. California in “The Greek,” Berkley’s cavernous outdoor amphitheater. Remember this was the 60s, and this was BERKELEY. During the pre-show set-up and rehearsal, the student audience started filing in. Berkley was the home of the SDS (Students for a Democratic Society) and their members chose to sit in the front rows right up against the stage. There was a hint of cannabis in the air and everyone was having a high time. Just before the show was to start taping, the leader of the SDS suddenly stood up and said that NBC was exploiting the students. It seems like one of the flyers distributed before the event in order to get an audience, listed one of the contestants on the show, The Chambers Brothers. 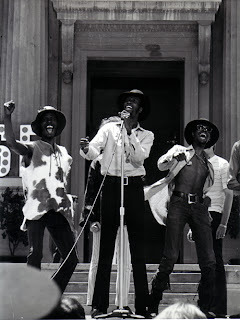 They had just released their first giant hit, “Time Has Come Today," and the students were under the impression that they were there to watch a concert featuring The Chamber Brothers. When they found out it was a TV show and the Chambers Brothers were only contestants in a contest, they (sort of) rioted (more of a "hissy fit). They grabbed and tore up all the show's cue cards (I was speechless), stood and chanted "No show. No show!," and would not let the show continue unless NBC donated $1000 to the student union and that, after the TV show was finished taping, the Chambers Brothers would give a one hour concert just for them. After much deliberation between NBC and the SDS, the producer of the show agreed to the $1000 donation and The Chambers Brothers to the concert and the show went on. The Chambers Brothers won the contest at Berkley, but, as karma would have it, in the finals held in Columbus Ohio, they were beat out by none other than Sly and the Family Stone. It was a very interesting summer. But, what I REALLY remembered about 1968 is that it was on Showcase ’68 that I first met and dated my beautiful future wife, Barbara. In 1968, THAT was the date to remember. And ... we lived happily ever after. I saw Tom Brokaw's special on the History Channel and it brought memories of not that long ago when Seattle hosted WTO and I worked downtown there. One night was particularly rowdy and there where cops marching and protestors and I did not know where to catch a bus to where I still live. It shed a different light on protests, which I had as a child, view as quite exciting. My memory of '68 was supporting RFK for President, Denny McLaine winning 30 games for the first time (and probably last time) RFK's assasination. I was 11, but an avid reader of Newsweek, Look, and Life so I think I was pretty aware of the National Scene. I remember watching the riots at the Dem. National Convention. I remember '69 being a much more peaceful year. Interesting what you have done here, reliving your own 1968 experiences. Great Idea. I would like other readers of the blog to do the same. "Where were you, and what were you doing 40 years ago in 1968?" I know I would be interested and I'm sure all the other Mouse Cliquers would feel the same. I was 8 years old in 1968 but even so I remember this as a dynamic time. I remember something interesting that Bill Clinton said once, that people who think the 60's represented good changes for America are more likely to vote Democratic. Those who idealize about the 50's and think that the 60's caused a decline in American culture or values are more likely to be Republican. I really think that's true! 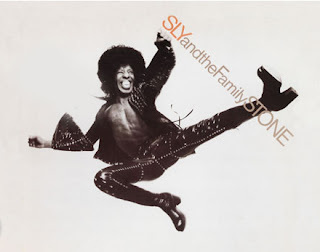 Funny my kids (13 & 17) have recently discovered Sly & The Family Stone, those songs are so great and totally timeless! There is a retooled Sly-less version of that band touring now called simply "Family Stone." "Dance To the Music" and "Everybody Is A Star," fabulous songs! How could I ever forget 1968! It was the first year of my marriage ... and my husband was in Vietnam 350 days of that year! I don't remember any TV shows from that year. Sorry Lloyd, not even Showcase '68. I was focused on the news. I remember being glued to my b&w TV with rabbit ears (no cable in those days!) hoping for a glimse of my husband in the background of one of those "live" broadcasts from the war zone. I never did see him, but did recognize a face here and there. So many I knew were there - and many didn't return. What times those were!! I remember waking up one morning and turning on 93 KHJ expecting my music and instead hearing the "live" broadcast of RFK Assassination that was being replayed on stations all over the country. I was devasted that yet another Kennedy had been assassinated. What times those were! I remember thinking THAT year would NEVER end. Now it seems like, not only that year, but the last 40 years went by in an instant! Makes one realize how important it is to appreciate every minute while it's happening and make the most of whatever life offers NOW - next thing you know you'll be looking back another 40 years! ... would you believe another 20 years? Doubt that I'll be around another 40 - that's a scarry thought! I was a young lad of 12 in 1968. I remember the assasination of MLK and RFK like it was yesterday. I remember watching the newscasts (usually Huntley & Brinkley) and watching the war brought home in our living room. I remember Denny McLain winning 31 games and cheering the Tigers over the Cardinals because the Cards beat my Red Sox the year earlier. I remember TV shows and music shows such as Showcase '68 (Lloyd, do you remember The Feminine Complex being on there? How about The American Breed doing "Cool It" and "Keep The Faith"?). Happening '68 hosted by Paul Revere & Mark Lindsay. I remember certain things in the 6th grade and starting 7th grade, that I won't get into (ha ha ha). I remember my oldest brother joining the Air Force and hopping on the train to go to Lackland AFB in Texas, wondering if I would ever see him again. (I did and he's still very much alive). I remember seeing Tiny Tim on TV for the first time. I remember going to the store and buying my first LP. Hmmmm...should I get Tiny Tim's TIPTOE...TULIPS album or Herman's Hermits Vol. 2 album with the giant poster of Herman in it? I got the Herman LP. It was Aug. 10, 1968.....that night I became an uncle for the first time. WOW...a 12 year old uncle! All my uncles are "old"! I don't remember 1969 being much more peaceful, though.....yes, we landed on the moon, but I'll never forget a certain murder happening on Cielo Drive in Aug. 1969. I also remember hearing about some giant music fest called Woodstock. All I could think of was how bad it probably smelled there. HIPPIES and POT SMOKING. It was a bad mix, in my mind. Hey Skipper, absolutely KHJ and the Reel Don Steele, me too! I remember not really sure who Bobby Kennedy was in 2nd grade but this is the first time I remember seeing my parents cry...that made such an impression on me and scared the bejeezus out of me! I remember that like it was yesterday, they were standing in the kitchen pouring martinis and they both hid their faces from me, they were like GO TO BED RIGHT NOW. Funny how some memories stay so fresh, like it happened yesterday! complete with music and commercials. It's like boarding a time machine.........Even though I was tormented by three older sisters way back then , those were really fun times. I remember 1968 well...It was the year i started getting interested in politics and world events...It was the year when i really started to understand what war was...and still could not understand why there was a war...It was the year Robert Kennedy and Martin Luther King were murdered...Yes...i remember 1968...It was the year that broke my heart when it was too young to be broken...Many of my classmates were oblivious to almost all of it...But i can't forget...Maybe more than it should have 1968 changed me...I would be aware of the dark side of life from then on...I was 8 years old. vividly remember the KHJ broadcast and watching them lower the flag to half-mast at my school (Carthay Center)Think I'd rather remember the ice-cream truck at Roxbury Park though! Great meeting you at The Egyptian Theater this summer. Hey Lloyd-I did an episode guide for "Showcase '68" at tv.com that I cobbled together from newspaper & TV Guide listings. If you haven't seen it you should check it out. I couldn't find much info on the series. The shows still exist via researchvideo.com, a company owned by former Shilos folk group member Paul Surratt. Wish we could see it somehow. For the record-I turned 9 in 1968 and spent a whole lotta time listening to the (a.m.) radio. One of the reasons I did the "Showcase '68" guide was to document the TV appearances by Chicago faves New Colony Six, American Breed & Cryan Shames. The other main reason was that information on this network show was virtually non-existent. That was just wrong. I'll try to get the series listed at the IMDB since it's the "go-to" place for all things film & TV. All my best to you Lloyd. Great articel on Showcase '68!!! Myself i'm very interested in the part of Sly & The Family Stone. The reason is i'm writting a book on them and aslo are working on a soon to be released documentary. I have still little info on the Showecase '68. Can you help me with this?? Any information is welcome. Also like to know if there us still some footage from this program. Great picture of Sly. I believe this is also taken at the Showcase?? Is it possible that i can use it for my book?? Please let me know. Are you willing to do a small interview with me by mail or phone? I was at this show. We wouldn't let Bobby Goldsboro sing. It was wild. Unfortunately, it was Passover and I had to get home, so I couldn't stay for the hour-long Chambers Brothers post-show concert. 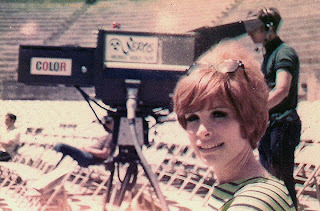 I remember watching my aunt, Suzanne Renee, on the New Orleans episode of Showcase '68. Very, very, VERY exciting time for our family! I was at the Greek Theater show, and it was quite a bit different from what is described above. It was certainly not just the SDS involved in protesting the show-though they may well have started it. The entire crowd participated in refusing to go along with some rigged contest, where Bobby Goldsboro was clearly the prearranged winner, when we were all there to see the Chambers Brothers. Besides the electrifying Chambers Brothers performance, what I remember best was that there was some cheer they tried to lead the crowd in to kick off the show, but every time they started we would all go into "F*U*C..." you get the picture. Finally, the program agreed to donate money if we would be good. So we were pretty good, except that we made it very clear that if the Chambers Brothers did not win, there might be trouble. What a time! I was 15 and my friend & I were in the seats on the field for the taping during the Ohio State Fair finale. I remember being in the hot summer sun waiting for Sly & The Family Stone to finally show up after being about 1-2 hrs late. I watched it on TV and wish I had a DVD of that show.